On December 19th the Electoral College votes for President. This is the real Presidential election, so believe it or not, it’s still not over. And until it is, we’re going to be subjected to #nevertrump antics to keep pulling out last ditch efforts to rewrite the election. To that end, electors are getting death threats and many more are being tracked down for intimidation efforts. This seems to be rather unprecedented and I can’t recall electors being under quite this much pressure, even during 2000’s Bush-Gore slugfest. 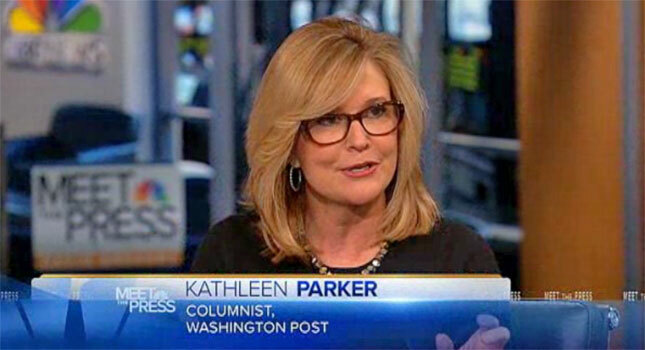 Enter “conservative” columnist Kathleen Parker. As a card carrying member of the establishment, her version of conservatism is s showing “growth” by rejecting bit by bit, conservatism. However the rise of Trump and the establishment reaction of #nevertrump gives an opportunity to give a clean break. Give it a few years and formerly conservative columnists will be cranking out columns indistinguishable from their leftist counterparts. Did George Will write this or Eugene Robinson? I can’t tell any longer. Yes we do. These are mostly Bushies who have been wounded by Trump’s rejection of their Iraqi Invasion. Suprun may not be the greatest example of principled opposition. In his Op Ed, he listed Trump’s attacking of Saturday Night Live as a sticking point with him. Talk about a superfan! But Suprun seems more like a ringer as his PR firm is the one founded by communist and former Obama administration green jobs czar Van Jones. So maybe not the best example to use…? So there you have it. A call to overturn the elections, but I wonder, oh fair Kathleen, what will that “bravery” cost the country? The odds of this are extremely low of course, but think what it would mean to have electors threatened, bribed, or intimidated into changing their votes so that it alters a Presidential election? Whoever the electors anointed as President would have no legitimacy, and Trump supporters who always thought that the “establishment” would never let a real swamp draining reformer into office would be vindicated. But the damage would exceed whatever happened over the next four years. It would be a permanent scar on the body politic. Presidential elections would become meaningless since anyone who can get to the electors can anoint the next President. When governments lose all political legitimacy, crazy things can happen. With the Soviet Union, and the Eastern Bloc nations, it was relatively peaceful. For Yugoslavia, it was not. But in any case, our government would lose legitimacy. To paraphrase Hemmingway, gradually, then suddenly. So a warning to Parker and other shortsighted pundits, who on November 4th insisted that everything will be fine no matter who wins, and now want to overthrow the government, once you pull out that particular string, it will never go back in. This entry was posted in Politica and tagged #NeverTrump, Christopher Suprun, Columnist, Electoral College, Faithless Electors, Hamilton Electors, Kathleen Parker, Politics, Saturday Night Live, Van Jones. Bookmark the permalink.